Sens. 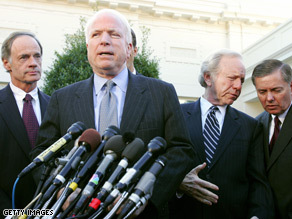 Carper, Lieberman and Graham stand behind John McCain at a press briefing. (CNN) - Every senator who looks in the mirror may see a potential president – but in a new survey, they’re a bit more equivocal about the No. 2 job in the executive branch. Since the final three presidential hopefuls are sitting senators, a member of that body is sure to occupy the White House this fall. The Hill asked the remaining 97 if they’d consider accepting a vice presidential slot. Some said they’d be happy to join the ticket. "Yes. Sign me up,” said Democratic Sen. Tom Carper of Delaware. “I've been kidding people for years: The hours are better, the wages are just as good - whoever heard of a vice president getting shot at? - and it's a great opportunity to travel. “And actually since time has gone by, the job is robust … So sure. Anybody here would, if they're going to be honest. The chances are slim to none. But I promise you, I would deliver all three of Delaware's electoral votes." Others seemed a bit less enthralled with the idea. Virginia Sen. Jim Webb, whose name has often been floated as a potential running mate for the Democratic nominee this year, did not embrace the notion – though he didn’t rule it out, either. "I'm not really interested. That's all I want to say," he said. It will be so funny when Hillary lets the dumb Democratic Party have Nobama and runs as an independent candidate. She will have a realistic chance at the White House (and no matter what will mess it up for the other two). I would like to see McCain pick Romney but that is a long stretch. HIllary should VP up with McCain. She's republican anyway, don't deny it. Those two can have the white racist vote. They won't win without the black vote or the enlightened white vote. We have a serious race relations problem in this country and we are still stuck 60 years in the past. Australia, New Zealand, and England have moved on, why can't we? And to all the Clinton supporters who think she won't change into a Republican Red pantsuit, Joe Lieberman did, so it is possible, Hillary could do the same. She was a republican until she married Bill. She's not a fighter, she's a liar, and that's what Republicans excel at. if hrc cant be president , we want her for vp; then we can tell mc cain to go fishing in his retirement . You may as well pick Liarman,he is like your memory John. After reading all of the asinine comments here, I shudder to think of the politicians the American people will elect to the White House. I mean come on, after four years of George Bush, the people re-elected him for a second term? McCain will be more of the same. You are so quick to say stupid things about Hillary, but Obama is not any better. He is a politician just like the rest of them. He makes a nice speech but he is arrogant and self-serving just the same.